Auto-launch iTunes 4.0 for music sharing. Is there a better alternative to launchTunes? Is launchTunes really the best app in Audio category? Will launchTunes work good on macOS 10.13.4? launchTunes is an iTunes companion that ensures your music is available when you run iTunes. Although iTunes 4.0 finally introduced Bonjour-based music library and playlist sharing, it came with one significant caveat: if iTunes isn't running, your music isn't available. launchTunes solves this problem. 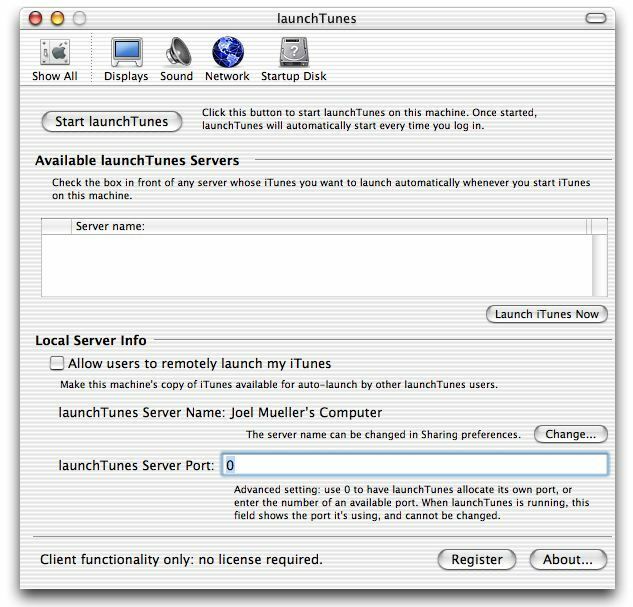 When you launch iTunes, launchTunes springs into action, automatically starting iTunes on the Mac servers of your choice! No more hunting for the iTunes server, no more locked offices or dorm rooms preventing access: it's all handled for you through the magic of Bonjour. launchTunes needs a rating. Be the first to rate this app and get the discussion started!